Globally the subject of sports has been one of the most popular ones among the readers for a long time and it's catching up in this part of the world too. The readership of sports has grown substantially in Pakistan during the last couple of decades in particular. The national newspapers that used to have limited space for sports news items in the past have now been prompted to flash the sporting events even on their front pages because of the massive following of sports in the country. 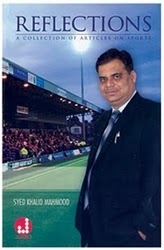 Similarly more sports books are being published from Pakistan now than ever before. The libraries now do have a choice of putting the quality work on the subject of Pakistan sports alongwith the international titles. Syed Khalid Mahmood, writing on sports for over three decades, has an unmatched depth of knowledge besides a flair for crisp description. His articles and write-ups are followed all over the world which is evident by the number of visitors on his blog, which is probably the first one on sports from Pakistan. Having previously authored 10 books I think it was a nice idea on his part to have put together a selection of his articles in book form. The latest book Reflections is a collection of his top 50 articles published on his blog in 2009.In my opinion Reflections also serves the purpose of being a chronicle of Pakistan sports in 2009. Almost every major sports event Pakistan participated in during the year has been covered with the success accomplished in the ICC World Twenty20 Cricket Tournament getting the prominence it deserved. Being an international writer he has also touched on the subjects of interest to the global audience. He has opined candidly on the various issues and he has been complimented generously by the President of the Pakistan Olympic Association, Lt Gen Syed Arif Hasan in the foreword to the book. Besides the high quality contents between the covers, Reflections has been very neatly designed and printed and it's one of those books that should be on the shelf of every library, be it academic, public or private.